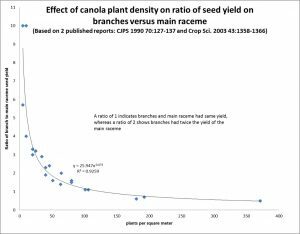 Yield and quality benefit from leaving canola standing longer before swathing. The common recommendation is to wait until at least 50-60% seed colour change (SCC) on the main stem. But that may be overly simplistic — especially if plant populations are low. 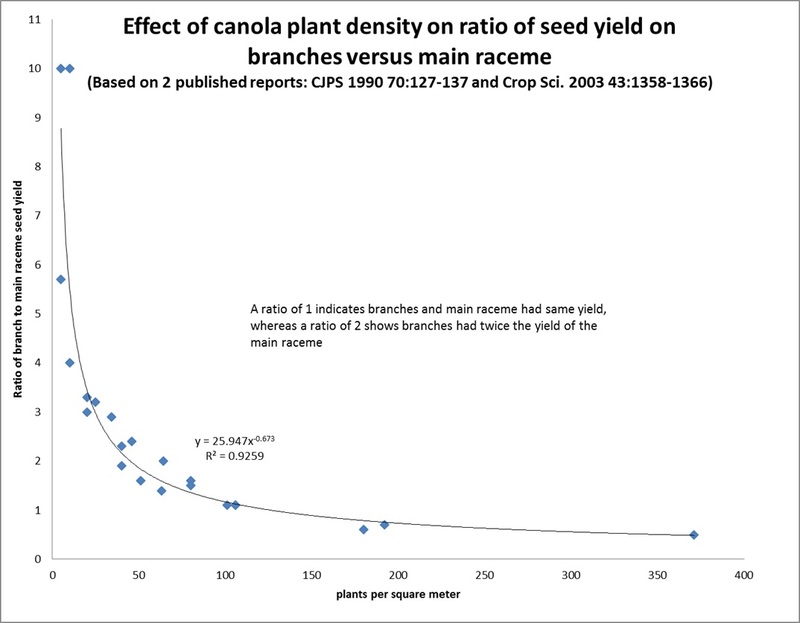 The graph below shows that as plant populations drop, more and more yield will come from side branches. At 10 plants per square foot, about half the yield will come from main stem pods and half from branches. The ratio is 1:1. At 5 plants per square foot, two thirds of the yield comes from side branches (2:1) and at 3 plants, three quarters of the yield comes from side branches (3:1). With very low plant populations, the swath decision should be based entirely on what is happening on side branches. Swath when most (or all) side-branch seeds are “firm to roll.” Mushy watery seeds will not mature if swathed in that state. With thin stands, growers will often have to strike a balance between shattering of earliest pods and watery seeds in the latest pods. If that makes for an unsettling situation, it may be worth reassessing seeding rates and stand establishment practices to increase plant populations. Consider the variety. Swathing at 80-90% seed colour change on the main stem may be too late for a variety without some sort of pod-shatter tolerance. It may be worth having a conversation with the seed company to know a bit more about the characteristics of a variety. Either way, leaving that canola for straight combining may be the best choice if swathing is delayed to the point where shatter losses become unacceptable. Varieties that tend to have higher green seed counts (or chlorophyll in the oil) will benefit in quality from swathing a little later or straight cutting. See CGC 2015 quality data by variety (specifically chlorophyll). Swath timing and disease. Swath timing should always be based on the staging for plants that will contribute the most to yield. Diseased plants don’t tend to contribute much to yield and usually should be disregarded for the swath timing decision. Plants senescing early due to disease will not likely produce many viable seeds, so a decision to swath early because of these dying plants can actually make the situation worse. One exception where early swathing could provide an economic benefit is the case of severe alternaria black spot — where pods are at high risk of infection and early shattering. As the swathed crop dies down, spread of alternaria will slow down, hopefully stopping this disease from infecting pods. Alternaria can still spread in the swath, but not as quickly — in theory — as on living tissue. Other diseases rarely warrant early swathing. In the case of blackleg, sclerotinia stem rot and clubroot, base the swath timing decision on healthy plants that will contribute to yield. Swath timing and lodging. Whatever the cause for lodging — wind, rain, late-season hail — the crop will present a harvest challenge. Swathing low to the ground doesn’t leave much stubble to hold the swaths in a wind and can limit air-flow through the swath. Swathing lodged crop often leaves a lot of bunches in the windrow. And lodged crop may need to be swathed in the same direction. There is no clear advantage to swathing versus straight combining lodged crop. It often comes down to personal preference.